A last will and testament is not cast in stone, and you should review your will periodically to be sure it still reflects your preferences. Any major life event can warrant making a will update. In California, amend your will with a codicil or, better yet, replace it with a new will. 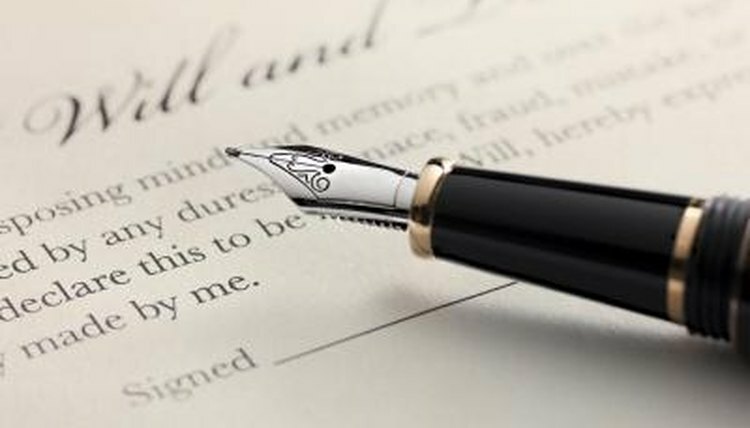 Wills are legal documents that usually must be signed in the presence of two witnesses in California. Whether you opt for the form will set out in the statutes, commonly referred to as a statutory will, different form will or an individually prepared document, the document sets out the names of the persons or entities who will inherit your assets when you die. It can also name an executor to shepherd your estate through probate and mention your preference for guardians for your minor children. These formalities may suggest that a will should be forever, but this is not true. Your will should change as your life changes. If your financial position alters significantly or your family increases, decreases or changes through marriage, divorce, birth, adoption or death, your old will may no longer represent your current wishes for the disposition of your estate. In California, the rules for changing a will are set out in the state's probate code. Your options are essentially two: draft a codicil or write a new will. A codicil seems like the easiest way to amend a will in California. You only need to write out the changes you wish to make to the old will, label the document a codicil to that will, and sign the document in the presence of two adult witnesses. This works best with small changes, such as adding a newly born child to the children who will inherit assets from your estate. Complex changes prove more difficult. Note that any cross-outs or after-the-fact additions you make to the original document that are not validly executed as codicils will be disregarded by a probate court absent "clear and convincing evidence" that they represent your desires. This is not a risk most people want to take when other, surer methods to amend are available. When you make a new will that disposes of all your assets, it automatically cancels the former will. Many reasons exist to consider making a new will rather than a codicil to update your old will. The "simple" change you describe in a codicil may affect more provisions of your will than you realize unless you review the document as a whole. Also, a codicil is a separate document that can be lost, destroyed or otherwise separated from the original will, negating your intention of amending the will. Since the same number of witnesses are needed to execute a codicil as a will, it may be wiser to redraft the original will with additions and deletions, print it out and sign it. California is one of the states that recognizes handwritten wills, termed holographic wills. To be valid, the primary provisions of the will must be written in the hand of the person making the will and signed and dated by that person. These are valid without witnesses. Make amendments to holographic wills by handwritten, signed and dated codicils. Again, it may be preferable to write an entirely new will. Nolo: Why Not Make a Codicil to Amend Your Will? Spengler, Teo. "How to Update a Personal Will in California." , https://legalbeagle.com/6402106-update-personal-california.html. Accessed 20 April 2019.